**Queen of the North, Anne O’Brien’s enthralling new novel, is available to pre-order now** The Sunday Times Bestseller ‘O’Brien is now approaching Philippa Gregory status’ – Reader’s Digest ‘A dangerous word, perhaps, for a woman. Power.’ From her first clandestine marriage, Joan of Kent’s reputation is one of beauty, rumour and scandal. Her royal blood makes her a desirable bride. Her ambition and passion make her a threat. Joan knows what she must do to protect her reputation…the games to play, the men to marry. She will do anything to get what she wants: The Crown of England. 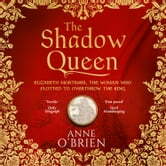 A tale of ambition, treachery and desire, The Shadow Queen tells of a woman’s ascent through the court to command royal power alongside her young son, King Richard II. Gave a good insight into life in that era. Would recommend. Insightful and interesting. Very well read so joy to listen and learn.